Putting Late Night In Perspective: Under The Massive Boot Of Judge Judy In all the fuss over late night, don't forget to keep your eye on syndication in daytime, where a lot of the real money — and viewership — is. Judge Judy Sheindlin, seen here in 2006, presides over a case as bailiff Petri Hawkins Byrd listens. While we go on about the Johnnys, Jimmys, Daves, Jays, Conans, and additional Jimmys of the late-night wars, where was Joe? Specifically, where was the enormous media coverage of the end of Judge Joe Brown? CBS Television Distribution canceled Brown's show in late March, reportedly after his daily viewership dropped from 4.1 million to 3.4 million. He was making $20 million a year — a few million more than Jon Stewart and a few million less than Jay Leno, according to a list circulated by TV Guide. Leno, by the way, gets about 3.5 million viewers, according to recent numbers. Just about the same as Judge Joe Brown was getting after the drop that led to his cancellation. But if you really want some perspective on who makes the world go 'round when you talk television outside of prime time, look no further than the lace collar and magnificently heavy boot of Judith Sheindlin. She's bigger than all of them. 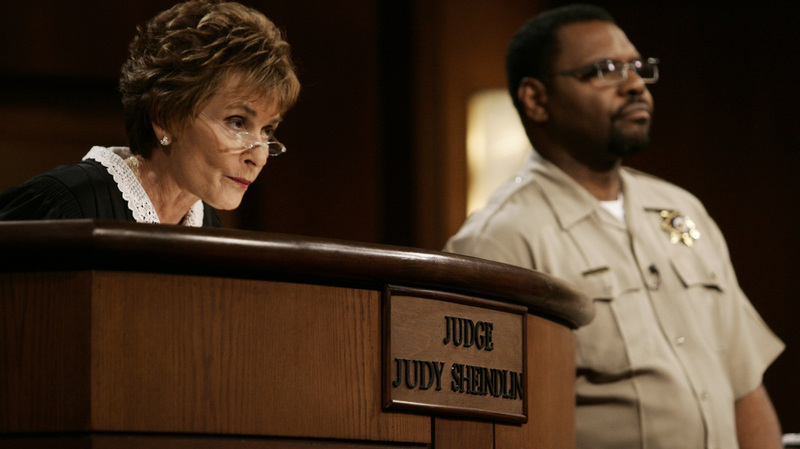 Judge Judy, according to the most recent week of ratings, is watched by more than 9 million people in this, her 17th season. In current television terms, particularly outside the high end of prime time, that is a lot. Leno and David Letterman both land between 3 and 4 million viewers, generally. Jon Stewart and Stephen Colbert, beloved though they are, get under a million. Why don't you hear about her contract? More than 9 million people, $45 million a year. If she were a late-night host, she'd be more than doubling her nearest competitor in total viewers (that would be Leno) and outearning her nearest competitor by $17 million (that would be Letterman), while taking six days a week off. How is this not a thing that we stand back and look upon with massive, goggle-eyed amazement on a regular basis? And in fact, at the time Judge Joe Brown was canceled, Brown was highly competitive in both salary and ratings with Leno and Letterman, and his contract dispute and cancellation went by with very little discussion. None of this is to argue that covering Judge Judy's [extremely satisfying, it must be said] smackdowns would have a lot of creative heft, but neither does covering The Tonight Show. All of this contract business, the ratings business, the secret-meetings-to-plan business ... it's business. Late night is a huge thing largely because we've decided it's a huge thing. We've decided that guys in suits in front of curtains are important and women in lace collars behind benches are not so important, even if the lace collars are bringing in two or three times the eyeballs and making twice the money, and even if what's under discussion is not at all the art aspect but the commerce aspect. It means there's little discussion of things like the fact that syndication — especially courtroom syndication — is late night's polar opposite in terms of diversity. While it's true, as has been said, that late night remains for now largely a white guy's game, courtroom syndication features both female judges and judges of color, including Sheindlin, Brown, Marilyn Milian (of The People's Court, whose Spanish admonitions even her English-only viewers can probably rattle off by now), and many others. If the interest is in the art, then late night is probably overattended to. But if the interest is in the money that's moving around and the eyes that are being drawn, well, it's probably overattended to there as well.